As a sustainability, environmental and engineering intern for Charlotte Mecklenburg Utilities Department (CMUD) in 2012-2013, Jacob Monroe had the responsibility of mapping the fiber optic cable network in each of Charlotte’s five wastewater treatment facilities. The internship was the type of hands-on experience that any undergraduate engineering student would relish, but for Monroe, it was life-changing. As he looked at the facilities, the way each tied in with the humans using the system and the energy resources that powered each one, he began to see the interconnectedness of it all. In fact, were it not for that experience, he might not be where he is today: on his way to earning a Ph.D. in civil engineering, and the recipient of both the Hood Fellowship, funded by Ed Hood Jr. and his wife, Kay, and a Graduate Research Fellowship from the National Science Foundation (NSF). Monroe’s work toward a doctorate follows a successful undergraduate career at NC State, where he had the opportunity to work under the guidance of Dr. Emily Berglund, associate professor in the Department of Civil, Environmental and Construction Engineering. Berglund, who now serves as Monroe’s research adviser and is the leader of the socio-technical systems analysis research group, is one of the top faculty in her field. Monroe said the decision to attend NC State for his undergraduate degree was an easy one. He was raised in Aberdeen, North Carolina, where an uncle first piqued his interest in civil engineering and, specifically, wastewater research. NC State’s reputation for both its program and its faculty made the university a top choice to pursue his interests. Monroe graduated in 2016 with his B.S. in environmental engineering. He chose to stay at NC State to pursue his Ph.D. because of his respect for the faculty. Yet, were it not for the fellowships, Monroe said his plans would have been different. “I wouldn’t have gone to graduate school. I would’ve gone straight to the industry,” he said. The Hood Fellowship and NSF Fellowship together will fund Monroe through four of his five years working toward his Ph.D. His dissertation topic, titled, “Assessing Solar Photovoltaic (PV) Technology Diffusion and Grid Stability Using an Agent-based Modeling Approach,” involves research that will contribute toward improved power grid infrastructure and stability, as well as serve to educate policy makers on the impact of energy storage technology, hopefully stimulating funding in that area. The fellowships put Monroe in a unique position where he can focus on his dissertation, while many students in their first year would, for financial reasons, take on a teaching assistant or resident assistant role requiring 20 to 25 hours of their time each week. His goal is to become a tenure-track faculty member. Monroe said his time at NC State has helped him develop the leadership skills that will be key in that role. Through the support of the university, he has had the opportunity to attend research conferences, including one in the Netherlands. 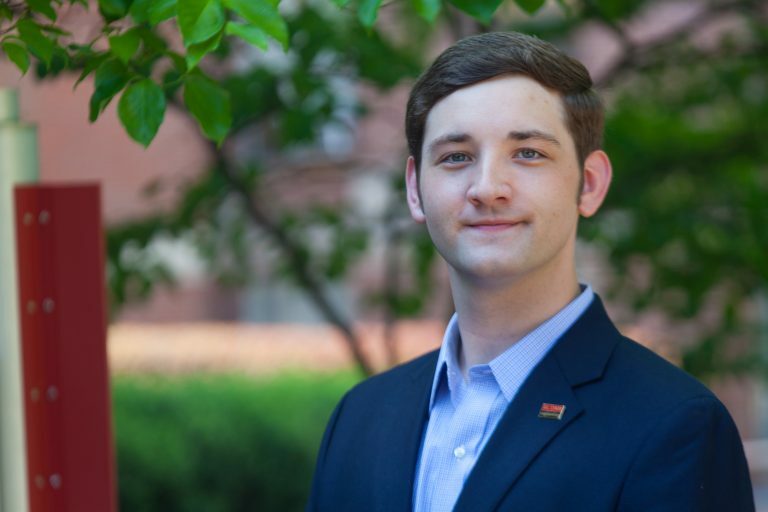 Monroe has been an active member of the Chi Epsilon National Civil Engineering Honor Society at NC State, serving as secretary. Through Chi Epsilon, he also assisted with departmental recruitment of undergraduate, and now, graduate students. He said that experience provided him with skills he’ll need as a faculty member, such as skills in communicating and in connecting people with the resources they need. Receiving the Hood Fellowship is the first step in demonstrating his ability to receive funding for his research – another key skill as a researcher and faculty member, Monroe said. The sense of interconnectedness and collaboration that Monroe sees in that work each day extends to his sentiments about the Hood Fellowship and those who gave to make it possible. “It’s all about the collaboration,” he said. “They’re not just funding me, they’re funding what I’m going to be doing for other people.